On the second day of the Turing Centenary Conference in Manchester there were more great talks. The screen showing the presentations was flanked by a large image of Alan Turing, reclining in a chair, reading a book. It was rather like having him present, listening to the talks. Tony Hoare asked the question "Can computers understand their own programs?" and proceeded to propose to answer it with an alternative to the Turing test. In the same way that "Can a machine be intelligent" cannot be answered without a definition of "intelligent", Hoare's question cannot be answered without a definition of "understand". Instead, if a computer can answer questions posed to it about its own program, and give correct and useful answers, and explain its reasoning, then we may conclude that it understands its program. These questions might be, for example: "Will this change make the program run more slowly". He also finished his talk with a hint at his current work on algebras for programming, by asking whether programming will become part of recognised formal logic in the future. See Tony Hoare's talk. Manuela Veloso is a robotics researcher who had 116 robots in her lab at a count in 2011. Her talk gave a tour of her work. This included planning and replanning in domains like robot football, purposeful perception (we only see/perceive what we need to deal with the task in hand, and if you arrive at an airport, you won't notice what colour the seats in the lounge are, because you're busy looking for a sign saying "Exit" or "Baggage"), robots that cohabit with humans and ask humans for help, and discussions about whether both robots and humans now use off-board AI. If Veloso and her robots had come to my school when I was young, I'm sure I would have wanted to be a roboticist immediately. In one visit to a school, a 6-year old asked "Did the robots wonder why you picked them up?" Donald Knuth gave a pre-dinner speech. This was actually just a short speech followed by question-and-answer session. He said that he was proud to be a geek and he believed that Alan Turing was 100% geek. He handled a wide variety of questions, such as "What advice would you give to a young researcher" (follow your muse), "Are your children and grandchildren programmers?" (my son is a maths teacher, my grandchildren are too young yet to know), "Are objects the same as co-routines (that question was from Bertrand Meyer, the creator of the Eiffel programming language, and the answer was an involved characterisation of their similarities and differences), "Whats your next book" (my life's work is the Art of Computer Programming, I'm working on the new volume, it's slow progress because I want it to be right). 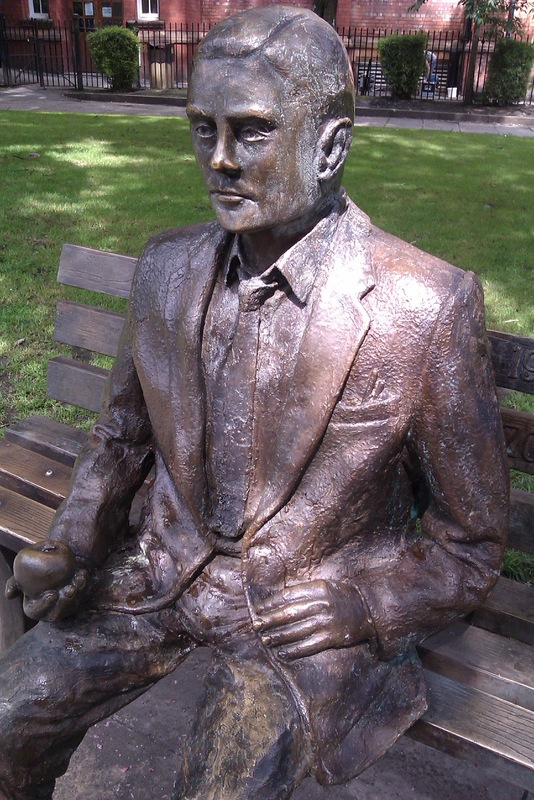 During his short speech, Knuth said that he'd been on Friday before the conference to see the Alan Turing statue in Sackville Gardens, near Manchester Piccadilly. He'd sat there on the bench with Turing's statue, and he and Turing both sat there and thought for about 10 minutes, and he found it wonderful, and he recommended it to us all. When I left the conference on Monday lunchtime, I went via Turing's statue and did the same. The statue is life-size and feels strangely human, especially when you sit on the bench next to him. I'll never get to meet Turing, but I think that attending a 3 day conference all about his work, followed by sitting next to his life-size statue on a bench is probably the next best thing. See also my writeup of Day 1 and Day 3 of the conference, and the online video recordings of the talks.